Situated at the end of a cul-de-sac and within a short walk away from Hook village centre, schools and mainline station is this well presented four bedroom detached family home with benefits and accommodation that include entrance hall, lounge/dining room, newly built conservatory, kitchen breakfast room, cloakroom/shower room, family bathroom, new double glazed windows & doors, gas central heating to radiators, attached garage and a private south facing rear garden. Internal viewing is highly recommended to appreciate size of this family home. Front aspect double glazed window. Well fitted comprising inset stainless steel sink unit and drainer with mixer tap and cupboard under. Additional range of eye and base level units with roll top worksurfaces over. Cooker. 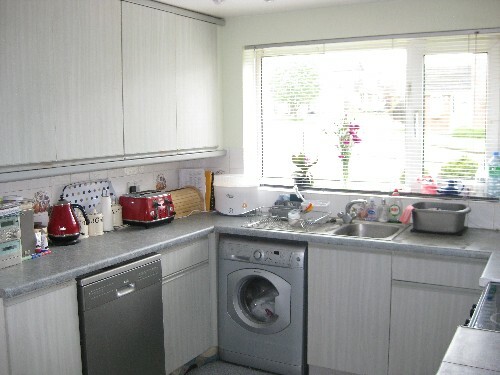 dishwasher, washing machine and fully plumbed American style fridge freezer all included. Wall mounted gas fired boiler. Attractive tiled splashbacks. Radiator. Double glazed door to garden. Newly constructed with brick base and double glazed windows & doors. Quality wood flooring. Double glazed double doors to garden. Access to loft space (part boarded, light). Linen cupboard. Double glazed window. Doors to all rooms. Rear aspect double glazed window. Radiator. Full width ceiling to floor built in wardrobe with mirror sliding doors..
Rear aspect double glazed window. Radiator. Built in single wardrobe. Three piece white suite comprising panel enclosed bath with separate Triton shower unit over. Shower screen. Low level w.c. Pedestal hand basin. Extensive wall tiling. Vertical chrome radiator. Extractor fan. Shaver point. Double glazed window. Up and over door. Power and light. Double glazed door to garden. Landscaped easily maintained private south facing garden. Laid mainly to lawn. Full width paved patio area. Whole area fully enclosed giving a high degree of privacy. Side access. Double glazed door to garage.